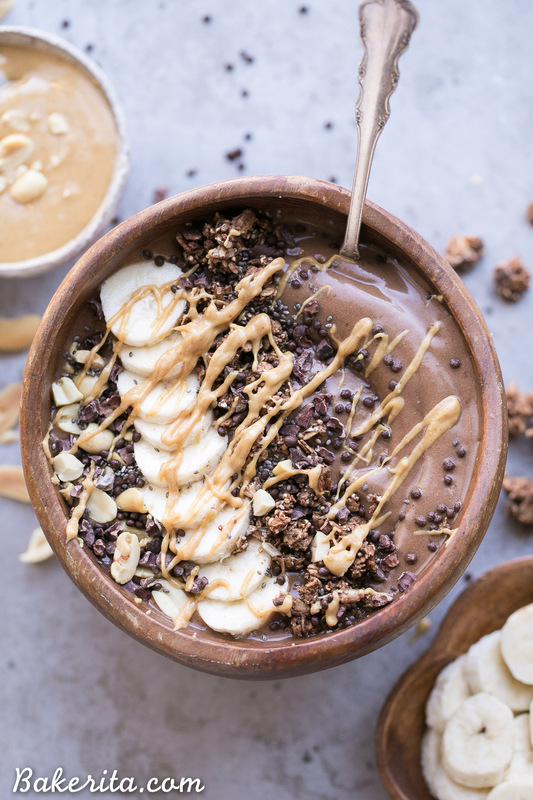 This Chocolate Peanut Butter Banana Smoothie Bowl tastes like a peanut butter cup, but it’s actually a filling, superfood-packed breakfast that comes together in just 5 minutes! 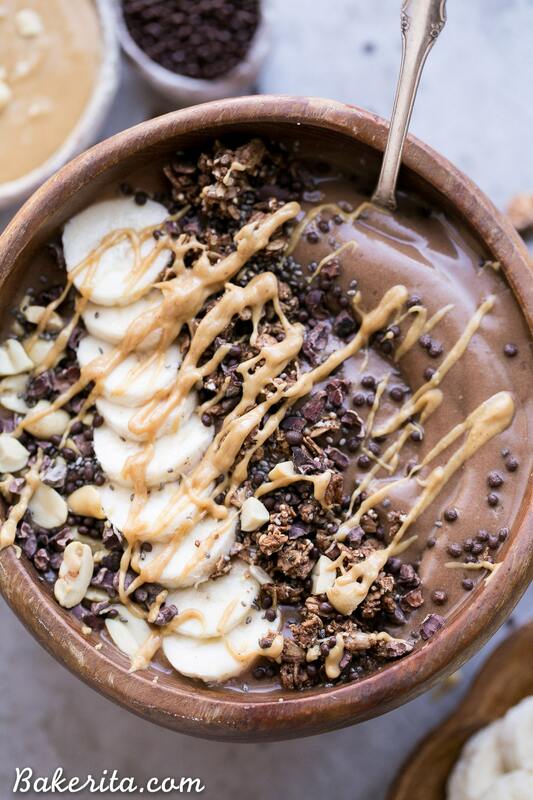 This gluten-free + vegan smoothie bowl is the perfect way to start the day. Sooo…I feel pretty bad for everyone who has been stuck in a pile of snow this week, with their power out, and blizzards swirling all around, and temperatures that are way too cold for me. Especially because here in San Diego, we’ve been having an absolutely beautiful week of sunshine and more than a few of those days have passed 80ºF. In fact, as I’m writing this, it’s 8:15 PM and I’m sitting outside in a dress and I’m not even chilly. Sorry to rub it in…kinda.  On weeks like this one, I flip between San Diego and Seattle on my weather app and it makes me really happy that I decided to move home. I’m definitely a California girl at heart! With this warmer weather starts my itch for summer’s long, warm days, and I’m already starting to crave all the fresh, bright, refreshing food that spring and summer brings with it. 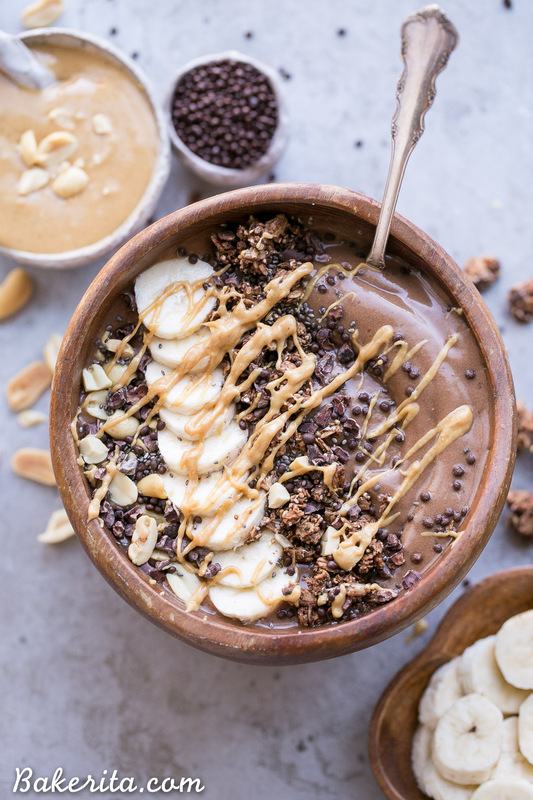 During the spring and summer, juices, smoothies, and smoothie bowls become a staple part of my diet – as evidenced by the number of delicious smoothie bowl recipes I’ve posted over the years! They’re creamy, flavorful, super refreshing, and they make the perfect vehicle for allll the superfoods and allll the toppings. 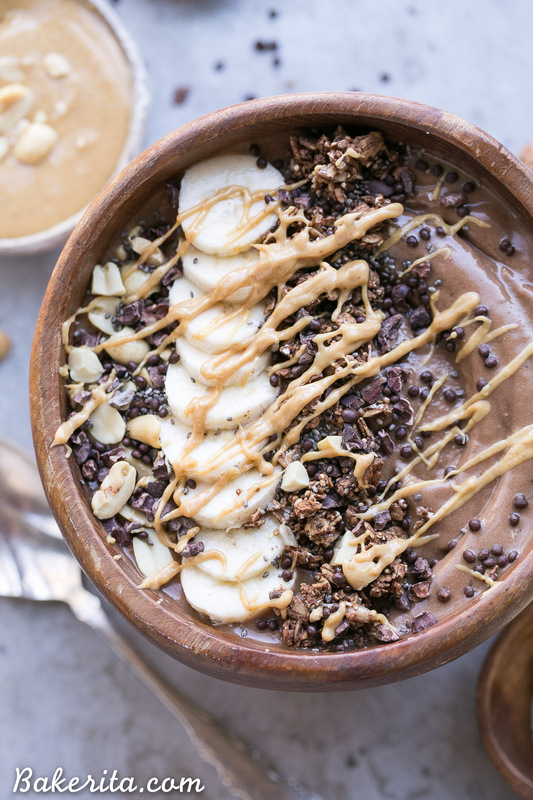 Chocolate and peanut butter together is pretty much my favorite thing ever, so it’s a wonder that it’s been this long without me creating a chocolate peanut butter smoothie bowl. This is just the inevitable coming into fruition, and it’s just as delicious as I imagined. 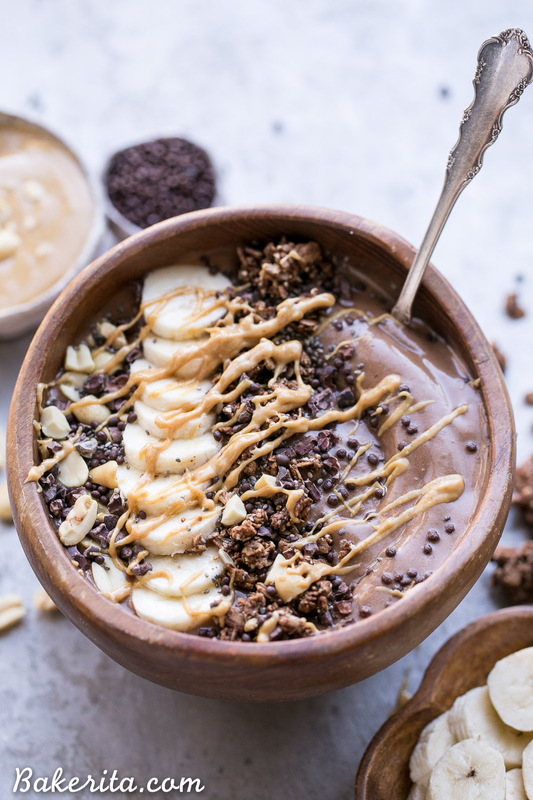 Frozen bananas are the base of the smoothie bowl, and make things super creamy and add lots of sweetness. A little almond milk helps things blend up smooth, and of course we’ve got to have peanut butter and cacao powder (or cocoa powder – whatever you’ve got will work). Now if that’s all you have, it will be delicious as is, but I loaded mine up with a few of my favorite superfood powders. First, I added a few scoops of my favorite Vital Proteins collagen (that I talked about in my last post) which is flavorless but adds protein and is super good for you. I also added two teaspoons of MRM’s maca powder and a tablespoon of chia seeds. The maca adds a deliciously nutty and sweet flavor, and the chia seeds will help thicken it all up a little bit. I topped my bowl off with banana slices, some of my favorite chocolate probiotic granola, more chia seeds AND dark chocolate covered chia seeds, some chopped peanuts and a drizzle of peanut butter. I went a little cray adding my favorite things, but it was soooo delicious. If you’re a chocolate and peanut butter lover like I am, you’re going to be a big fan of this one. Chocolate and peanut butter for breakfast is always a good thing, right?! If you agree, also see this chocolate peanut butter oatmeal :) enjoy! Combine bananas, almond milk, peanut butter, cacao powder, and collagen, maca powder, and chia seeds if using, in a blender (I used my Vitamix). Puree until completely smooth - the mixture should be thick. Add a touch more liquid if necessary to get it to blend completely smooth. For a lower sugar option, replace half or all of the bananas with steamed and frozen cauliflower! I definitely have the itch for spring and summer, too! It’s hasn’t been too bad in Chicago this year (knock on wood!) but it just needs to be summer! :) I always crave fresh fruits and veggies too, so this smoothie bowl was made for me. Love the chocolate and pb combo! The perfect breakfast! I can’t wait for those warmer days too!! Wisconsin still has a ways to go, but I’m excited anyways! I’m also super excited to give these gorgeous smoothie bowls a whirl! Can’t go wrong with peanut butter and chocolate for breakfast! Oh gosh….chocolate peanut butter ice cream for dinner? Yes, I’ll have that, please. Wow wow wow! This looks so good – one of the best combinations ever! Holy Macaroni! 2 of my guilty pleasures in one bowl! Chocolate and Peanut Butter are a perfect match after 5 days of dieting. Bless you for sharing it Rachel. I will definitely make some tonight while catching up with some episodes of Game of Thrones (perfect plan to be lazy isn’t it?) Hahahaha Thanks again! It does sound like a perfect plan! :) Thanks so much for the love, Samantha – I hope you love the smoothie bowl! Hahhah rub it in. We need to be reminded why we live in this misery…I Love this bowl!! Such a classic and satisfying breakfast. Ok so totally jelly of the weather you are experiencing right now! I was just in AZ last week for spring break and we stayed for an extra day because our flight at home got cancelled because of Stella. Buttttt, the cold does not stop me from enjoying smoothie bowls! Chocolate+ PB + Banana is the most glorious combo known to man! I’m always shivering with my smoothie bowls, haha! Hopefully the east starts warming up soon…at least we’ve reached springtime :) thanks Beth! Chocolate and pb is such a good combo! 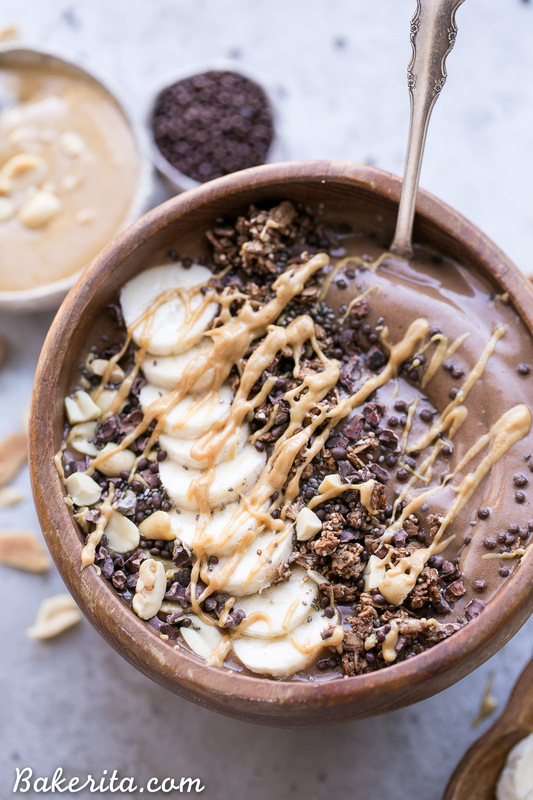 I’d love to start my morning with this smoothie bowl! It’s my favorite! Thanks so much Jessica. This is seriously amazing! It can’t possibly be good for me, it’s that good. So simple and so tasty. My 2 year old keeps harassing me for more. Thank you! So glad it’s a hit with you and your 2 year old!! It’s one of my favorites too :) thanks for your feedback! Hi! Just wanted to make sure…does this recipe mean to have 2 1/2 bananas for one serving for one person? Thanks for your time. Hi Sally, depending on how hungry you are, this could feed 1 or 2 servings. The recipe calls for 2 bananas in the smoothie. If you want to reduce the sugar, you could use one banana and use a cup of steamed and then frozen cauliflower for the other banana. Enjoy! I just made this – it was really good! Thanks for the amazing recipe. So thrilled to hear you’re enjoying it! Hi! I haven’t made this but this looks delicious!! I’m vegan and this would be a great recipe just without the collagen since that’s not vegan. Thank you for sharing your recipes they look amazing!! Yup, you can definitely skip the collagen or replace with a vegan protein powder if you’d like. Enjoy! !